Welcome friends and family to your home with the abundant blessings of food and handcrafted décor for the season. With the joy of turkey, stuffing, casseroles and, pies, Thanksgiving is the time to reflect on the richness of your life and enjoy autumn’s great day. And it wouldn’t be Thanksgiving without our orange friend, the pumpkin. We love pumpkin recipes and wish we could enjoy them year round, but autumn is the perfect time to turn on the oven and cook some delicious desserts made with pumpkin. At RecipeLion we've collected some of our favorite pumpkin recipes for dessert that will have your guests eating bite after bite. And thanks to our friends over at FaveCrafts, we've also collected some of our favorite Thanksgiving crafts for the season to make your home festive and fun. Bring the cozy feeling of Autumn into your home with hand crafted decoration that is perfect for the season and check out our Holiday How-To: Thanksgiving Crafts and Pumpkin Recipes eBook. Bring the comfort and care of Thanksgiving to your home. With the leaves changing colors and the weather getting cooler, the feeling of Fall is setting in. And from the first leaf falling we are thinking about Thanksgiving dinner. When people think of Thanksgiving recipes they think of the classics: turkey, stuffing, cranberry sauce and green bean casserole. But Thanksgiving has more to offer than savory dishes for dinner. Thanksgiving is also the perfect time to show off your cooking skills and to make something with pumpkin. Pumpkin recipes are highly sought from the first to the last days of autumn. Their spiced cinnamon and nutmeg flavors warm the body and have people craving pumpkin year round. This holiday season make something with pumpkin to bring to the dessert table. Whether you choose to make a pie, a cake or a cookie, bless your guests with a treat made with pumpkin. They’ll want you to host Thanksgiving every year. If you’re hosting Thanksgiving, it’s important to create a festive atmosphere for your guests. The perfect handmade centerpiece can tie the room together and bring the autumn feeling that your dinner table needs. Show your guests that you’re not only a master chef, but also a professional crafter. Create the feeling of love and comfort in your home and enjoy the splendor of Thanksgiving. If you're looking to add something new to the dessert table other than pumpkin pie, be sure to indulge in these great pumpkin recipes for Thanksgiving. 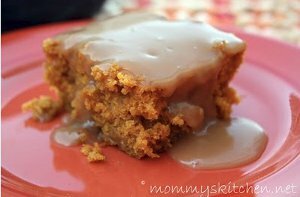 We just love the fall-time flavor that pumpkin desserts have. With a hint of cinnamon, nutmeg, and cloves, pumpkin desserts have a delicious bold flavor that makes each mouthwatering bite irresistible. In our eBook Holiday How-To: Thanksgiving Crafts and Pumpkin Recipes you'll find pumpkin recipes for cake, cookies, cupcakes and much much more. It wouldn't be a Thanksgiving feast without great pumpkin recipes to have after a hearty turkey filled dinner. You'll want to check out our Pumpkin Bars with Fluffy Cream Cheese Frosting for a sweat treat that the family will adore. Plus, we even have pumpkin sweets that would be perfect for a Thanksgiving breakfast. Don't miss our Cinnamon Pumpkin Doughnut Muffins and enjoy them with your morning coffee. Enjoy pumpkin recipes from the moment you wake up until the moment you go to sleep. Download your free copy of Holiday How-To: Thanksgiving Crafts and Pumpkin Recipes today! Create an atmosphere of love and comfort with these great Thanksgiving craft projects. You can spruce up your house to give it an Autumn feeling that will warm the hearts of your guests and create a real sense of Thanksgiving. These holiday craft projects are easy to make and cost less than the holiday decorations you find in the store. Plus, they leave you with a feeling of accomplishment and leave your house looking festive. 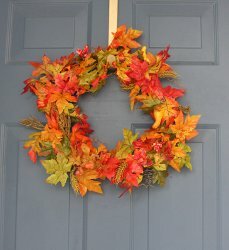 In Holiday How-To: Thanksgiving Crafts and Pumpkin Recipes you'll find some great projects like the pictured do-it-yourself Colorful Fall Wreath. Add a bit of color to your home and create these wonderful Thanksgiving crafts. The dinner table is where everyone comes together to share their thanks and enjoy the splendor of Thanksgiving. So, we've collected some Thanksgiving crafts to accent your table and to make dinner as festive as can be. Thanksgiving is the time to take out the fancy dinnerware and impress your guests with elegance and fine dining. These wonderful do-it-yourself Thanksgiving projects can make an average dinner table turn into a table fit for kings. Craft your own holiday tablescape and create your very own centerpiece that will display the beauties of autumn. If you're like us, you spend most of your time in the kitchen on Thanksgiving, preparing the turkey and making sure everything turns out great. In Holiday How-To: Thanksgiving Crafts and Pumpkin Recipes you'll find some great craft ideas that will make your kitchen also your craft room. You can even make some of these wonderful holiday crafts with your kids, so they can be in the kitchen with you. 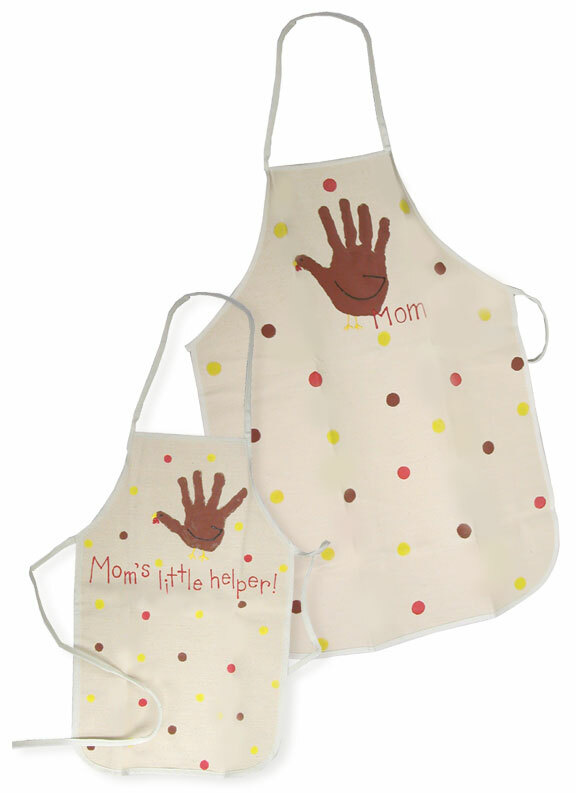 With our Mom and Me Thanksgiving Aprons you can create your own Thanksgiving apron for you and the kids to protect yourselves from the splatters of the kitchen. It doesn't get any cuter than that. We hope that you have enjoyed hearing all about our free Thanksgiving eBook, Holiday How-To: Thanksgiving Crafts and Pumpkin Recipes. We had a lot of fun putting it together and working with FaveCrafts. Show your guests that you’re not only a master chef, but also a professional crafter. Create the feeling of love and comfort in your home and enjoy the splendor of Thanksgiving. Enjoy! If you're looking for even more easy Thanksgiving recipe ideas, be sure to check out another one of our free eCookbooks, 30 Thanksgiving Recipes, which includes everything from turkey recipes to stuffing and cranberry sauce recipes. You can download the printable collection here. Also don't miss out on any of our other holiday eCookbooks. We have plenty of quick and easy recipe ideas for all of your favorite celebrations including Christmas, Halloween, Valentine's Day, Easter and more! You can browse all of our free eCookbooks on this page. Access to our recipe large collection full of over 40,000 recipes, including budget friendly and quick and easy recipes. View and download the complete collection of free RecipeLion eCookbooks here. NOW WHAT?? HOW DO I DOWNLOAD THE BOOKS? I HAVE INSTALLED ADOBE READER.